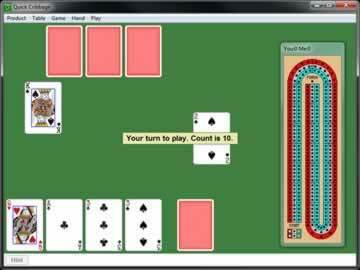 Quick Cribbage Game - Download and Play Free Version! Play Fast One-on-One Games of Cribbage Anytime! 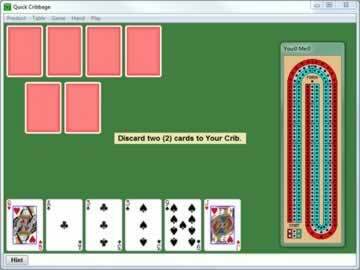 Cribbage, also known as crib and six-card cribbage, is a simple but fun game. It tests your skills at card-counting, encourages you to strategize how to play your cards correctly, and relies on just enough luck to make things interesting. Unfortunately, it’s not a particularly well-known game these days, meaning you may not get the chance to play or practice it as often as you might otherwise like. Luckily, if your friends are not down for a few rounds of crib, then Quick Cribbage will make a more than suitable substitute. If you know how to play cribbage, then you should be at home here, for this electronic edition abides to all the classic rules that you enjoy. On the other hand, if you have never even played a game of cribbage in your life, then Quick Cribbage is a good way to familiarize yourself with it. Don’t worry, cribbage is easy to learn! From the six cards you are dealt, choose which of the four you intend to retain. Play any card you want every turn. Just make sure the cumulative sum of all the currently played cards does not exceed 31. Score points for a variety of factors, including making a sum of 15, landing a card directly onto a sum of 31, playing pairs, forming flushes, and more! The cycle continues until a winner is determined. Whoever scores 115 points first wins the game! Anybody who’s play cribbage will know that the game involves a fair amount of math. It is never anything difficult, but one small mistake on the part of either player can potentially bog the game down. Fortunately, those problems are nonexistent in Quick Cribbage. Thanks to its electronic format, you can focus all your attention on the current game at hand while the computer handles all the details in the background. 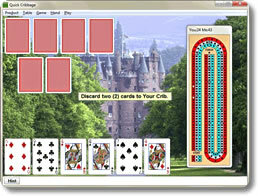 The game keeps score for both you and your computer opponent. Informs you about the current sum of all cards played. Automatically updates the scoreboard using an authentic cribbage board. Lets you know which cards are valid to play. If you ever feel the need to play a fast round of cards, then consider giving Quick Cribbage a try. Whether you’re an experienced player or are just in the mood to learn how to play a new card game, it will make a worthy addition to your personal game library. Better yet, it won’t cost you a dime. Get in a crib today!